Environmentally friendly folders contain 100% post-consumer content. 10 each: evergreen, imperial gold, royal navy, ruby red and warm violet. 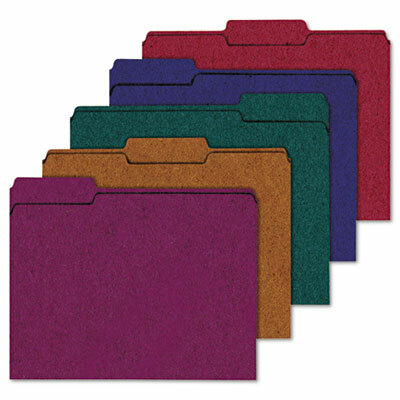 Environmentally and office friendly files. Envirotech™ file folders are created with 100% post-consumer recycled material making them an eco-smart choice. Sturdy construction from 11-point stock makes them a great choice for busy work environments. Scored for 3/4" expansion to handle larger projects.